It was predicted by indigenous tribes in Africa that when the White Lions return to their sacred lands in Timbavati we would be in a time of evolutionary and spiritual awakening. On Christmas Day in the year 2000, Marah the White Lion was born, the first “way-shower” to arrive and help us awaken to our divine origins, when we were one with all life in Zep Tepi, the land of first time. Our spiritual warrior selves are being summoned to heal the separation between us and nature, to be the change agents of heart, as we evolve to a higher consciousness. Exploring how to awaken to the energies and messengers of ancient Africa that reside along the 31st meridian, the spine of Mother Earth, Carley Mattimore and Linda Star Wolf take you on a journey to connect with our original roots in Africa, hidden deep within our DNA. 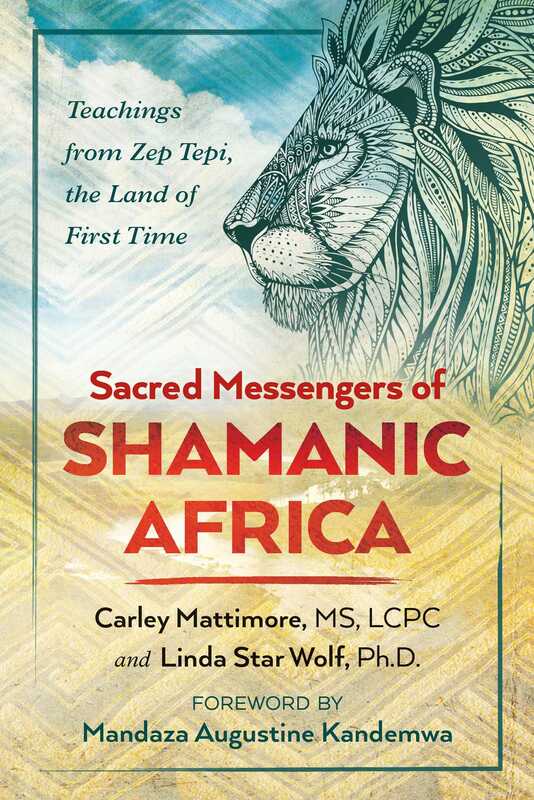 They share shamanic journeys and teachings to connect with the strengths of Africa’s spirit animals, including the inner authority and heart of Lion, the loyalty and wisdom of Elephant, the love and compassion of Giraffe, and the shadow side of Hyena. They explore the power of shamanic sacred sites and offer teachings on the African Tree of Life and the energetic hologram of the 31st meridian. Sharing wisdom from Mhondoro Mandaza Kandemwa, Grandmother Twylah Nitsch, and other wisdom keepers, the authors explain how, as we connect with the messengers along the 31st meridian, we begin to remember our sacred contract to protect the natural world. Offering a guide to reconnect with the ancient African wisdom of love and higher consciousness buried in our cellular memory, the authors show how we can help reopen the heart of humanity and heal the world around us. The animals and the natural world are relaying messages to guide and support humanity during this time of great change on the planet. The four-leggeds, winged ones, creepy crawlers, and more are coming to assist in this evolution of consciousness. As we release the self-imposed barriers between us and them, we are able to transcend the illusionary veil between us and hear their language. We are given the gift of their wisdom when we connect in love and respect and cross through the barriers that separate us. During several of our trips into the bush in Timbavati, South Africa, we experienced a close encounter with Giraffe. In the first meeting we came across a giraffe who stood close to our jeep. It looked right at us, bending its long neck to get a closer look into our vehicle, and sent a powerful message, shared with us by our guide, medicine man Baba Mandaza, that the war that is going on is not over yet. We were told to keep praying for guidance and that more light workers are needed to support Peace on Earth. The giraffe turned and walked away, its long legs gracefully striding through the brush and then it turned and looked back one more time, affirming the message to our group. Giraffes show up as messengers to encourage us to stretch ourselves--reaching as far as we can to bring about our visions, rising up to the challenge with balance and grace. They have an incredible ability to see into the future empathically from a bigger perspective and support us in influencing future outcomes effectively. Our second encounter occurred after our first class on animal communication, when we set out to practice our newly learned skills. Our jeep came upon a tower of giraffes. We stopped, held sacred space, and opened our hearts by imagining a bridge between our hearts and the giraffe’s closest to our vehicle. The giraffe’s big beautiful heart responded, as he stopped and looked directly at us. As the transmission continued, he lowered his head and stretched his long neck to come closer to us. It was such a direct response to the love we sent, evidenced by the most miraculous expression of curiosity on his face. His big beautiful heart and ours merged in loving compassion and I felt like mine would burst. The giraffe as an animal messenger serves to remind us to open our hearts and see the bigger story of our lives and of humanity at this juncture in our evolutionary journey. It is time for each of us to step up and do our part in coming into balance with grace and power. With a commitment to become more empathetic and openhearted, use deep cyclical breathing to go deeply within and to connect with the energies of your heart. As you feel more relaxed and in the flow of energy, imagine your mind’s eye starting to open and find yourself gently walking through a savanna with a thicket of slender trees, tall tangled brush, and dense acacia bushes. Take a deep breath and as you exhale notice that your human body begins to shape-shift effortlessly into the tall, graceful form of an 18-foot-tall giraffe. Your great height gives you a unique perspective that others may not have and therefore perhaps a greater understanding of your surroundings and the actions of others. Feel into the long stretch and smooth arch of your strong, graceful neck as you graze on tasty green leaves, grasses, and twigs. Suddenly, something in the nearby brush startles you and you gallop in the opposite direction to safety, reaching a speed of 35 miles per hour in a matter of seconds. Once you perceive that you and those you love are safely out of harm’s way, you slow your pace and take respite under the highest tree branches, scratching the top of your head on branches and finding a cool place from the sweltering sun. Your enormous twenty-five-pound heart, the largest of any land mammal on earth, is still beating rapidly from the run. It has such a big job to do to pump the blood all the way up to your head and through the rest of your amazing body. While your imaginal giraffe body is settling into a more relaxed state, engage in an inner dialogue with your own human heart and connect it to the bighearted energy of the sacred giraffe. Take a moment to make this connection as you feel the beating of your human heart. Engaging your own bigheartedness, think about what you love and cherish and allow that vision to flow into your conscious awareness, filling you with love. Giraffes are now on the endangered species list. Since 1985, 40 percent of the giraffes have disappeared. How does this affect you? Allow yourself to imagine what you love being threatened and perhaps its very existence coming to an untimely end. Notice any feelings of distress, such as sadness, anger, despair, helplessness, or fear, and then let those feelings move through you. Ask yourself what, if anything, you could say or do in your life to change the course of its extinction. Inhaling and exhaling deeply, imagine that by connecting with Giraffe your own heart is energetically growing larger, increasing its capacity to hold the pain and suffering of other beings in the world without despairing but filled with loving compassion that translates into responsible action in the world around you. Allow the heart energy of Giraffe to inspire you with renewed faith that humanity can open more fully to its own bighearted energy and make the changes needed for the survival of us all. Once you have completed this journey, shift gently back into human form and slowly return to your outer consciousness with a big heart full of loving compassion for all beings great and small. Carley Mattimore, MS, LCPC, is a shamanic psychotherapist with 30 years’ experience as well as a therapeutic energy worker. She has traveled to Timbavati, South Africa, and Zimbabwe several times. She teaches shamanic workshops at the Aahara Spiritual Community in Springfield, Illinois.